EPIPS is an acceleration based de-icer for ice protection on ships and aircraft. This system provides an efficient low power solution for both metal and composite applications where sufficient electrical power is not available. IDI developed the system in collaboration with NASA Glenn and DARPA’s SBIR program. The de-icer features a series of eddy current actuator coils and electronics packaged into an integrated actuator assembly. Actuator coils are strategically placed behind the leading edge to apply impulsive loads directly to the outer surface material. The rapid acceleration de-bonds and sheds ice into the airstream in a very efficient manner (ice layers can be shed as thin as .050”). 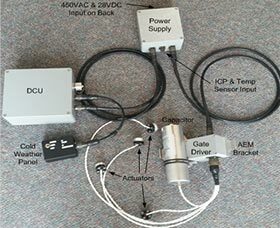 The main components of the de-icing system are the De-Icing Control Unit (DCU), the Actuator Electronic Modules (AEM), and the Leading Edge Assembly Modules (LEM). An optional Ice Sensor provides automatic deicing control when a threshold ice thickness is detected.